I received a copy of The Godborn by Paul S Kemp free to review via Netgalley. I should preface my thoughts by noting that I am not very familiar with Kemp’s The Twilight War trilogy and when reading this book I often felt as if I were a new reader to the Wheel of Time who had picked the series up at book four. I had the impression that a lot of assumptions of previous knowledge about the world have been made and I often found it difficult to keep up. I suspect that if you are already up to speed, you will have quite a different experience reading this book than mine. This is reflected in the low rating I gave this book. The Godborn tells of Vasen Cale’s quest to reunite the shards of Mask’s divinity which had been split among three people and to prevent Shar’s reincarnation which would lead to world destruction. At least that’s what I think it was about. I wasn’t very clear. The premise. I felt the idea of pieces of divinity having to be collected and reassembled interesting and well done. Lack of focus. The Godborn is a relatively short book at only 336 pages, yet I felt it had a cast equivalent to that of the Wheel of Time. Too often I felt that we spent a few pages getting to know a character who then disappears a few chapters later. In such a short book this time would have been better spent concentrating on our main characters so that we actually care about them. Without time devoted to them, our protagonists feel flat. I couldn’t help comparing this to The Companions, the first in The Sundering series, which is a far more tightly focussed book concentrating on four or five main characters. Likewise, I felt there were too many irrelevant plot lines. For example, while I liked Brennus and his homunculi, his relationship with his brother and father and his desire for revenge felt irrelevant to the main plot line. Overemphasising themes. Clearly light vs dark is a major theme in this book. I understand that. I didn’t need it rammed down my throat every five or six pages. By the end of a few chapters I was groaning and shaking my head at yet another mention of Vasen’s shadows alongside the faith light of his shield or the silver hidden beneath the tarnish. All in all, I struggled to finish this book, and I suspect it was partly due to my lack of familiarity with Kemp’s previous work. If you have not read them, I cannot in all honesty recommend this book to a new reader. If you have read The Twilight War you may enjoy it a lot more. If so, please let me know in the comments. I gave The Godborn by Paul S Kemp two stars out of five. I’ve had my Kobo Aura for about a week and a half now, and while there has been a lot I have loved about it, it hasn’t been a 100% positive experience. The industrial design is great – I love the bezel flush with the screen and the device is very light and thin. The new UI looks good and the Pocket integration is fantastic. Tor.com often has great snippets of upcoming books on its website and I find it awesome to be able to click a button and have those on my Kobo. Kobo often touts its handling of PDFs, and in all fairness it’s probably better than that on the Kindle. However, I tried to read a PDF book I have and gave up after a few pages. I found manoeuvring around the document very cumbersome even with Kobo’s navigation tool. For PDFs, tablets rather than eReaders are definitely the way to go. Searching on the Kobo reader – or the website for that matter – is completely hit or miss. For more common books or authors there is no problem. However trying to search for Anne Robillard for example brought up every Anne under the sun except Robillard. The biggest issue I’ve had is that the screen is very unresponsive compared to other eReaders I’ve had. Many times I’ve had to press three or four times to change a page. Today it became severe enough that I decided to call Kobo support to discuss a replacement. After 10 minutes on the phone, I was left with a completely unusable eReader. I was told to take photos of the device and am now waiting on an email with further instructions about the replacement procedure. I couldn’t help thinking Amazon would have had a replacement device on its way to me this evening. A few days ago, Amazon announced the updates to its Kindle Fire line of tablets. Here is the page with the details. Mayday button. This is the most innovative of the inventions and allows you to be connected to a video chat with an Amazon tech support person. Your tech will have the ability to view and control your screen to assist you. This could be a godsend for the novice user. Amazon is at pains to stress that the agent can only see your screen, not you to alleviate privacy concerns. This is a very interesting feature and one I think could really differentiate Amazon tablets from the others in a saturated marketplace. On the other end of the scale, Amazon is touting better enterprise support. This includes support for data encryption, Kerberos integration so that users can browse corporate intranets and VPN clients. This is interesting. So far, Amazon has placed itself securely in the consumer market – I’m really not certain that a Kindle, limited as the OS is, is a big attraction for corporate use. One of the most asked for features is finally coming to the Kindle Fire – Collections! The biggest pain in the current Kindle OS is the inability to organise your content in any meaningful way. Many people resented the recent upgrade to the iOS Kindle apps which added collection support. The question was asked why this was available on iOS before Amazon’s own native system. This feature will be coming in November. Also in November, GoodReads integration will be included as previously announced for the new Kindle Paperwhite. Other features include a revamped email client – good! – and printing support. X ray has also been enhanced – it’s now available for music so that song lyrics appear onscreen as you are listening. This, along with X ray for movies is of limited interest to people outside the US. As of today, the new Kindle Fires are only available in the US. I am interested to see how long they take to come to Canada. What is unclear at this point is whether or not these features will be made available to current Kindle Fires via a software update. For me personally, some of these new features, especially Collections and GoodReads integration, are very attractive and would be a good reason to upgrade if they’re not made available on the other Kindle Fires. Will you be upgrading? Let me know in the comments. I hope you enjoyed last week’s guest post from Azrael, but now it’s back to regular programming. The books I have read in the last few weeks have all been worthy of full reviews, so expect to see them in the next few weeks. This week I started listening to Steelheart of which I have heard the first few chapters a few weeks ago when Audible released them early, free of charge. I do enjoy Sanderson’s writing so I’m really looking forward to this one. I’m also reading an ARC of Paul S. Kemp’s The Godborn. Expect reviews of these two soon. One series I love listening to on Audible is the Dresden Files series by Jim Butcher. I used an Audible credit to add book 5, Death Masks, to my library. I’m looking forward to this, but it will likely be a few weeks before I get the chance to listen to it. One of the books on Audible’s daily deals this week was The Picture of Dorian Gray by Oscar Wilde. This is a very interesting tale, and I was happy to add it to my library for the couple of dollars that it cost for the deal. To test out my Kobo Aura I bought Marie Brennan’s A Natural History of Dragons. I had read the sample and found it both amusing and engaging. I look forward to reading the rest. One book whose title I simply couldn’t resist was The Chocolate Thief by Laura Florand. I am a real chocolholic and I couldn’t pass this up for the $1.99 it cost me on Amazon. Of course with Whispersync for Voice I was able to pick it up on Audible too, for just a few dollars more. I’m hoping it won’t be too heavy on the romance side though. As I have enjoyed Kiera Cass’s The Selection series I picked up the novella The Prince. Final Catcall by Sofie Kelly. This is the next in Kelly’s Magical Cats mystery series. I love gentle mystery series in which the cat helps to solve the crime, and this is a good one. I’m looking forward to this. I have preordered it in Kindle format. Emerald Green by Kerstin Gier. This is the final book in the Gem trilogy and probably the book I’m most excited about this month. I read the German original, and I’m looking forward to the English translation by Anthea Bell which, if it’s like the first two, will be excellent. I know many of you are looking forward to this one, too. You should check out Tor’s sneak peak. I have preordered this on Kindle and will pick up the Audible version as soon as it’s available, which I’m assured will be release day. Heroes of Olympus: House of Hades by Rick Riordan. This is the fourth book in the Heroes of Olympus and I’m really looking forward to hearing what happens to Percy and Anabeth whom we left at more than a cliffhanger, more like falling off the cliff. I’ve preordered it in both Kindle and Audible formats. Bridget Jones – Mad About the Boy by Helen Fielding. This is the next in Fielding’s Bridget Jones series. I’m actually a little anxious about this one. I adored the first two in the series. In short, I was Bridget Jones. At the time it came out I was a single young woman in London building a social network and trying to find love. I’m now in my forties, as I understand Bridget is, so I wonder how well that maturing process is handled. I had preordered it on Kindle, but I noticed it is narrated by the wonderful Samantha Bond, so I have switched my preorder to Audible. Allegiant day. This is when the third and final book in Veronica Roth’s Divergent series. I’m very excited to find out what happens to Tris and Four in this book. Insurgent was left with some very interesting developments and I look forward to seeing them played out. I have preordered this in Kindle format as I wasn’t particularly engaged with the Audible narrators for the first two books. Altered by Gennifer Albin. This is the second in Albin’s Crewel World series. I read and enjoyed the first book, Crewel, so I’m looking forward to reading the sequel. I have preordered it from Amazon. Sense and Sensibility by Joanna Trollope. No, not the Jane Austen version, but Trollope’s updated version. HarperCollins is commissioning series of Jane Austen updates and this is the first. I’m intrigued to see what she has done with the story. I’ve picked it up from Amazon. That’s all for this week, folks. What new releases are you most looking forward to? Let me know in the comments! 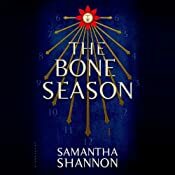 The Bone Season is Samantha Shannon’s debut dystopian novel and tells the story of clairvoyant Paige and her experiences as a prisoner of the alien Rephaim. I actually found this review quite difficult to write. It has been rescheduled time and time again. This is because, although I have read The Bone Season I’m still not entirely certain how I feel about it. It probably didn’t help that the hype machine was in full flow for this novel claiming that Shannon was the next J.K. Rowling. That set an impossibly high bar for the novel. The unique world building. The world of The Bone Season feels fresh and unique. There are layers within layers. The novel starts in a dystopian future version of London in which clairvoyance is illegal. This society is nicely described, but then we get another layer of the world of the Rephaim and Emim. The relationship between Paige and Warden. It was pretty clear that Shannon was setting up a romantic relationship between Paige and her keeper, Warden. Initially I was very resistant to that; it seemed such an imbalanced relationship with Warden’s having the power of life and death over Paige. Shannon did well though to even the balance between the two. The development of their feelings for each other were developed slowly and realistically. Action packed finale. Not a particularly slowly paced book, the whole last section is just one whole rollercoaster ride. The narration. First time narrator Alana Kerr takes on narration duties for The Bone Season and did an excellent job. I will certainly keep an eye out for other novels narrated by her. Lots of jargon. There is a whole vocabulary associated with the world Shannon has created. Our protagonist has grown up in that world and with that vocabulary, so it wasn’t always explained as clearly as I would have liked, which rather jolted me out of the story. While I can’t say the book bowled me over, I did feel it was well written, and I will probably check out the sequel when it’s released. Hello, my name is Azrael. I am an archdemon and easily the most powerful character in a novel called “The Final Requiem.” You probably have not heard about the novel yet, and that is perfectly fine. The novel has not been published yet. The creator of my world, Joe Donahue, is looking to try to self publish the novel sometime in the next couple weeks. It is turning out to be a very exciting and stressful time for him. It is turning out to be a very monotonous and boring time for me. He has been having me write a constant stream of these things he calls guest blogs so that you mortals can read them. It essentially amounts to me writing what I think about the book in the hopes that people will read it. Sometimes, if it is not for a blog that typically does book reviews, it will be me talking about whatever that blog usually talks about. The end result is always hoping that it will lead more people to read the book. Personally, I think the fact that the book gives people the opportunity to bask in the brilliance that is me should be enough reason for people to read the book, but I guess Mr. Donahue wants me to do more so here I am. The topic of the book is the ongoing war that has been raging on between angels and demons in my world. It all goes back to when sin first came into being. That one, great moment, created gates between Hell and Earth. These gates have allowed us demons to be able to travel to Earth in our spirit form ever since. We’re unable to take our physical form because the main gate between Hell and Earth is closed, for now. The presence of demons in spirit form, however, also permeated the world in dark magic that prevented the angels from taking their physical form as well. Well, we started doing what demons do best and used our cunning to find ways to interact with children in their dreams. Why else would you think an infant would have a nightmare without having knowledge of the world? We demons don’t get credit for the resourcefulness that we are truly capable of. Well, the angels did not like our direct interference in the slightest. Every time we assigned a demon to corrupt a child they would assign an angel to protect that child. That leads us to the beginning of the story that Mr. Donahue has so excellently orchestrated, and I say that because he included me in it. Although it is not bloody likely that he could have told this story without including me. We demons became tired of not being able to take our physical form, so we chose a boy named Antonius to be our chosen one and told him he would be the one that would assist in opening the main gate between Hell and Earth and once and for all make it where we could take our physical form. The angels chose a sniveling wretch of a human named Michael to be their chosen one. I will honestly never understand why Joe Donahue picked that vomitus mass to be the protagonist. The angels try to use Michael to close every single demon gate between Hell and Earth, removing the demonic presence and making it where angels can once again take their physical form on Earth. Oh what a joyous and happy ending that would be for them wouldn’t it? Well, I hope this guest blog has given you some interest in reading the book that I take part in, “The Final Requiem.” The angels have their chosen one and are trying to close all of the gates and we have our chosen one and are trying to open the main gate. The only way for you mortals to find out what happens is for you to read the book once it is published. It should be available on CreateSpace and Kindle sometime in the next few weeks. I would also like to thank the mortal that has given me the opportunity to post this guest blog here. It is much appreciated. If you enjoy this blog then you should take the time to read their blogs, their other guest blogs and the book reviews that inhabit this site. All updates about the pending release of “The Final Requiem” will be placed on http://joebrewing.wordpress.com and on Twitter @JoeBrewing. Watch both of those locations regularly to find out when it will be available for download.